Vector's map shows there are still several large outage areas in the west of the city, along with hundreds of smaller faults in dozens of suburbs, each representing one or more household still without electricity. Some households are likely to be without power for another week yet. Some have also been without telecommunications, and places that needed electricity to run pumps from their water tanks have been without water. If we regard last Tuesday a stress-test for infrastructure ahead of the super-storm assessed as Auckland's main disaster risk, the city has not done well. Indeed, we've likely done worse than anyone expected. Last week's storm was not an ex-tropical cyclone, but at its worst it was said to be the equivalent of a Category 2 cyclone. According to the relevant page in the Emergency Management section of Auckland Council's website, a Category 2 storm would be expected to bring the "risk of power failure". A Category 3 storm would make power failure "likely", while a Category 4 storm, with winds of 225 to 279km/h, would cause "widespread" power failure. At one point last week, 180,000 homes, representing more than half of retail electricity customers in Auckland, lost service. That seems quite "widespread". Vector, the region's lines company, has done a decent job of restoration given the sheer scale of the outages – but has also learned some hard lessons about its systems for communicating with customers. The app that was supposed to make things easier has in some ways made it worse, as residents try and use it to notify outages and still don't see their properties even listed for a fix. The company has had to create an old-fashioned web page listing all the faults yet to be fixed, along with estimated restoration times. Entrust is the entity set up (originally as the Auckland Energy Consumer Trust) to hold ownership of the electricity distribution part of the old Auckland Electric Power Board, which was spun off from Mercury Energy under the Electricity Industry Reform Act 1998 and became Vector Limited (Mercury itself was created when the AEPB was corporatised in 1992). Until 2005, the trust owned 100% of Vector, but Vector was allowed that year to issue new shares, diluting the trust's holding to 75%. Vector used the proceeds of the share sale to diversify, buying a gas company. I'm willing to lay odds that whatever money Entrust has set aside for undergrounding of power lines amounts to only a tiny fraction of the cost of undergrounding the 45% of the city that still has overhead lines (that's largely the older parts of the city – all new builds have underground lines). We're talking billions of dollars here. There are some drawbacks to undergrounding – it's harder to fix lines when something does go wrong, as Christchurch has discovered. And there are parts of Auckland where it might mean digging through volcanic rock. (There are reasons that Chorus settled for just stringing new fibre from existing poles in the UFB rollout.) 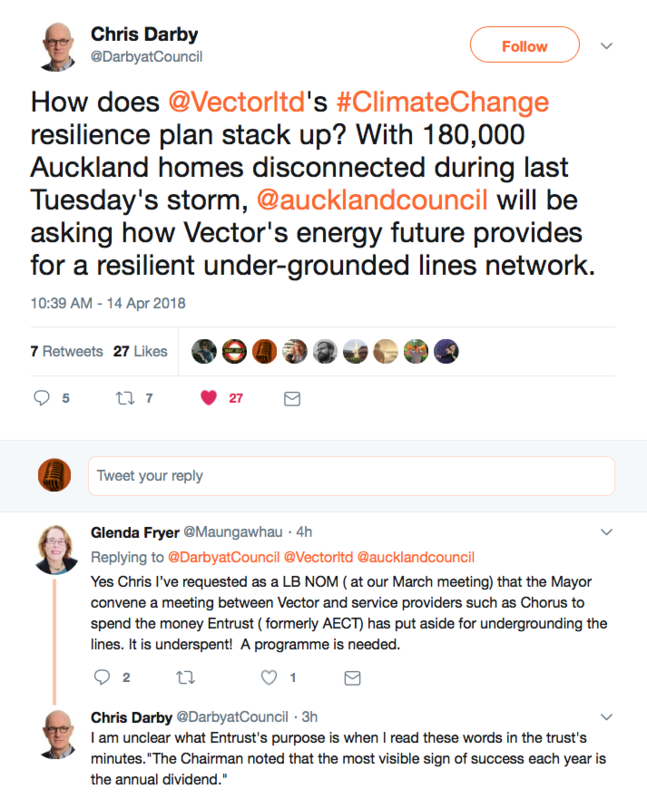 But we now know that a key part of Auckland's infrastructure is more vulnerable to its most likely kind of disaster event than had been supposed. We just don't know where the money might come from to fix it. The obvious answer would be from cancelling the annual Entrust dividends we electricity consumers have come to love. But last year's dividend was only $110 million and the trust has paid out only a billion dollars in the 20 years since its creation. Glenda Fryer, the deputy of chair of Eden-Albert local board, told me that her understanding is that Entrust has no cash reserves. You could see this as a failure of the corporate model for key infrastructure services, but I think it's a bit more complicated than that. It was, after all, the creation of Metrowater as a council-owned company in 1997 (it was integrated into Watercare Services with the creation of the Auckland supercity in 2010) that finally got the city past the fecklessness of successive centre-right councils, who repeatedly deferred maintenance so they could campaign on keeping the rates down. Finally, money paid for water services was actually being invested in water services. It could have been worse. It's hard to imagine Auckland without a sewage treatment facility, but Sir Dove Myer Robinson faced the storm of his political career – including the furious opposition of the New Zealand Herald – in getting the one in Mangere built. He didn't get a rapid-transit system over the line (indeed, things got so bad in the 1990s that the city's railway network was almost shut down to save money), so we're paying for that now too. Bringing water services up to standard not only has a bearing on how we deal with population growth, but – just like the robustness of the electricity network – how we deal with the consequences of climate change. Even with those consequences becoming a more urgent reality, it's hard to see this being sorted soon. 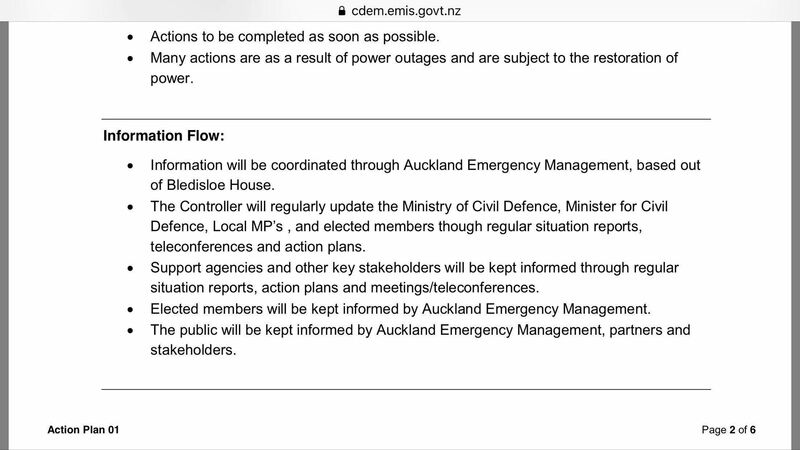 And in the interim, I think another council-controlled (and funded) organisation – Auckland Civil Defence Emergency Management Group, CDEM or "Emergency Management" for short – becomes vastly more important. In its 2016-221 plan, Working Together to Build a Resilient Auckland, CDEM talks about the need for "two-way communication and information flow to ensure consistent and timely messaging" and "integrating resilience across all levels of society". CDEM has done a good job of getting out to affected communities in the past week, but I think it needs to quickly improve its communications game both during and between calamities. It could start with a much better brand strategy – hardly anyone knows what Emergency Management is or what CDEM stands for – and then once it's got properly into our heads, talking to us about what resilience means in 2018. Even if what it means is "better buy a generator".